Is there a better alternative to FreeSpace? Is FreeSpace really the best app in Teaching Tools category? Will FreeSpace work good on macOS 10.13.4? 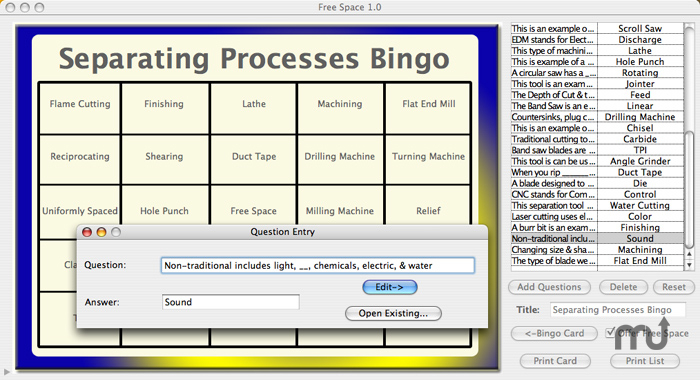 FreeSpace generates random bingo cards based upon a series of questions and answers the user inputs. The program can print either the card or the list of questions & answers. FreeSpace needs a review. Be the first to review this app and get the discussion started! FreeSpace needs a rating. Be the first to rate this app and get the discussion started!